SCVHistory.com LW3409 | Film-Arts | Gunsmoke: Memo to Cast & Crew on Use of Firearms, 1974. 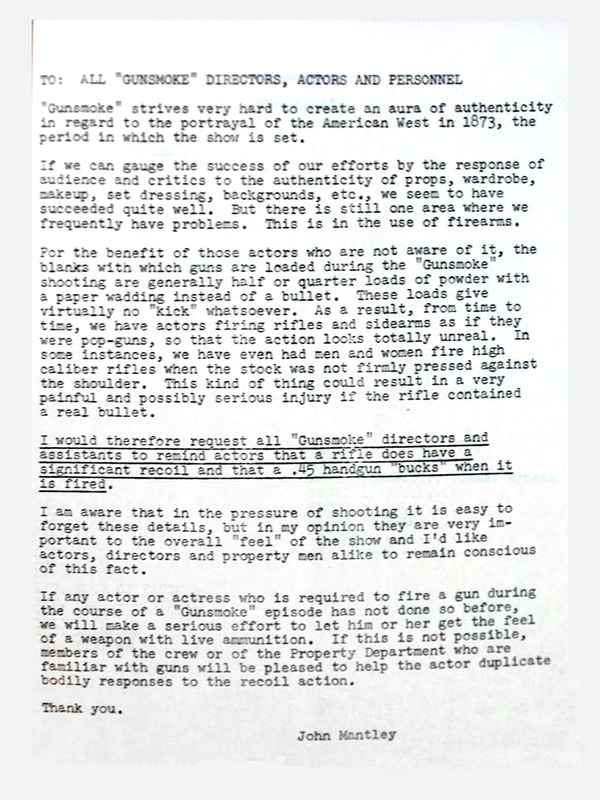 Memo from executive producer John Mantley regarding the proper use of firearms during the filming of the long-running CBS-TV Western drama, "Gunsmoke," which used Gene Autry's Melody Ranch studio for outdoor locations before the ranch buildings burned down in 1962. "Gunsmoke" strives very hard to create an aura of authenticity in regard to the portrayal of the American West in 1873, the period in which the show is set. If we can gauge the success of our efforts by the response of audience and critics to the authenticity of props, wardrobe, makeup, set dressing, backgrounds, etc., we seem to have succeeded quite well. But there is still one area where we frequently have problems. This is in the use of firearms. For the benefit of those actors who are not aware of it, the blanks with which the guns are loaded during the "Gunsmoke" shooting are generally half or quarter loads of powder with a paper wadding instead of a bullet. These loads give virtually no "kick" whatsoever. As a result, from time to time, we have actors firing rifles and sidearms as if they were pop-guns, so that the action looks totally unreal. In some instances, we have even had men and women fire high caliber rifles when the stock was not firmly pressed against the shoulder. This kind of thing could result in a very painful and possibly serious injury if the rifle contained a real bullet. I would therefore request all "Gunsmoke" directors and assistants to remind actors that a refile does have a significant recoil and that a .45 handgun "bucks" when it is fired. I am aware that in the pressure of shooting it is easy to forget these details, but in my opinion they are very important to the overall "feel" of the show and I'd like actors, directors and property men alike to remain conscious of this fact. If any actor actress who is required to fire a gun during the course of a "Gunsmoke" episode has not done so before, we will make a serious effort to let him or her get the feel of a weapon with live ammunition. If this is not possible, members of the crew or of the Property Department who are familiar with guns will be pleased to help the actor duplicate bodily responses to the recoil action. Mantley (1920-2003) was a Canadian-born screenwriter and producer best known for his work on "Gunsmoke." He joined the production as a story consultant during its tenth season in 1964 and went on to produce 223 episodes before the series wrapped in 1975 — first as associate producer in 1965, then producer in 1966, then exec producer starting in 1968. In between he squeezed in eight episodes of "The Wild Wild West" as well as the 1968 big-screen Western, "Firecreek," starring James Stewart, Henry Fonda, Inger Stevens and 1954 Hart High grad Gary Lockwood. After "Gunsmoke," Mantley exec-produced "How the West Was Won" with James Arness and Bruce Boxleitner, and nine episodes of TV's "MacGyver." LW3409: 9600 dpi jpeg. Online only.